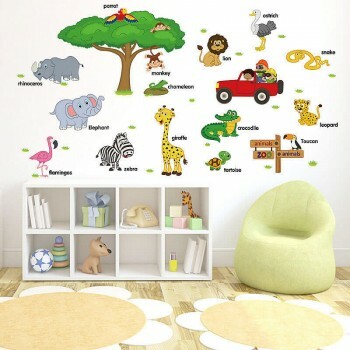 Animal wall stickers are the favourite ones for children. They are educating as well as entertaining. The sheer size spread on the wall makes them more effective to learn and remember (much better than books). And with that in mind, we bring to you yet another set of animal wall stickers. Probably the most educating wall decals of the lot, this wall sticker gives a lot of information. It is basically a world map which has tried to capture all the fauna in different regions of the world. Which continent is home to which animal would give a lot of learning to your kids and they might have a lot of questions too. All you need to do is be prepared to answer them. 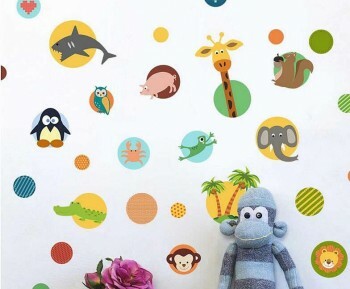 The colourful bubbles encircle different animals like Shark, Giraffe, Penguin, Owl, Elephant, Frog, Crab, Croc, Monkey and Lion and some bubbles (circles) are simply patterned. These circles are of different sizes and are not pasted on one sheet, thus giving you all the freedom to paste them anywhere on the wall. You could keep them close to each other or you could keep them apart. This is just like the page of a book, but with a difference. With the cute animal pictures and their names along, it really looks like a book page spread across the wall. This could be very educational for your kids and they could learn the names and the remember the picture of the animals much faster. 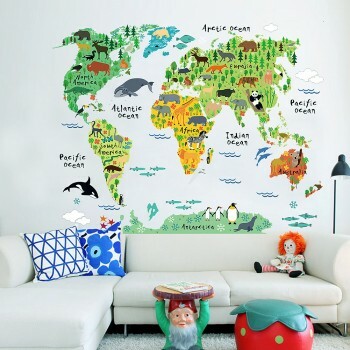 This is a neat and a colourful wall sticker which amazingly cute for your toddler. The scene in the decal looks like a picture of a couple of animals standing on the grass with a palm tree near. Animals on the ground are an elephant, a zebra, a giraffe and a rhino, while a koala is peeking through the palm tree and a monkey on a vine. Surround your children with all kinds of animals and not only terrestrial ones. 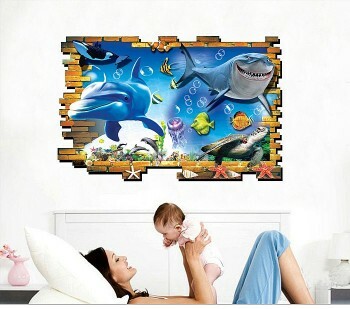 To give them a good understanding of aquatic animals, you could get this real animal pictures 3D aquarium wall decal. It has a whale, a shark, a turtle, a jellyfish, a couple of fishes, starfish etc. and these, real animal picture lets them learn the natural colors of the aquatic animals with a perspective of differentiable sizes.